Lately I have been gaining more interest in medieval pole arms, and although there are many reproductions of 15th-17th century pole arms, I am interested in finding some good reproduction polearms from the 1300's, especially halberds and bills, but spears, pikes, glaives, and poleaxes also. I believe halberds came into use in the late 14th century. Also, I seem to recall mention of billmen in accounts of the battle of Bannockburn in 1314. I really like the Arms & Armor English Bill http://www.arms-n-armor.com/pole030.html , and the text states it was used from the 14th to the 17th century, but since the original was from the late 15th, would this particular pattern be appropriate for a mid 14th century man-at-arms? I don't know how much designs changed over time. Welcome to the confusion surrounding polearms. Fire hardened spears have been in use since whenever, but true pole arms showed up in the Bronze Age. We';ve already had a large arguement and discussion surrounding Viking Polearms, with rather inconclusive results I might add. Inconclusive in that I do not think anyone's mind was changed. The English Bill, which I also dearly like, is an offshoot of a plain old gardening tool called a billhook. Still in use today, and you can find modern versions at the hardware store. I doubt very seriously if the form changed very much at all from the earliest days til the final days of its use. There is a curious dearth of examples of early polearms, and the earliest (very few) date only from about the 12 century. ( I might be a little off here, and just too lazy to check my books). The bill was not aimed at the gentry or the knights, despite the fact that it was a very effective weapon. It was usually reserved for the common soldier. The results is that there are only a few. After all, once the battle is over with, you take it back home and use it. About 25 years ago a friend and I made one based on the Tower, only we split the shaft so that both sides look like the one always shown on the Tower bill. Worked very well, but of course, police being not interested in serious research, we couldn't try it out on various people. If I can ever figure out how to put in a photo, I will. Thanks for the feedback Hank. Maybe I'll get the A&A bill after all. 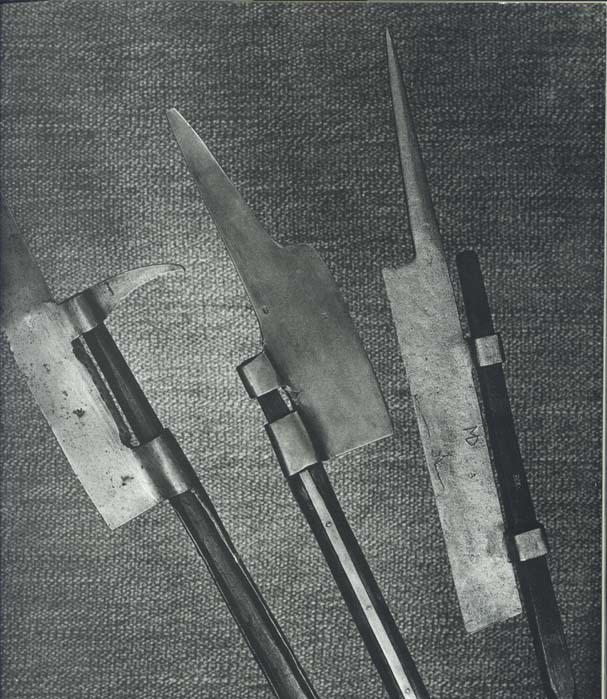 I don't know a ton about polearms, but here is a trio from a great German book. The outer two are from the beginning of the 15th century. The middle one is from the 14th century. I have a repro of the one on the left, but have yet to mount it. Bought an ash pole with a diameter a bit larger than the socket, which is 1 5/16" if I remember right, and plan to do it "right" but don't have a workshop and never seem to "find" the time. Also, it came with modern screws - I'd like to find some good, period style, rosehead nails, extra long to get the proper "u" bend when affixing. Don't have the facilities to "boil" in linseed oil, but it would get a good rubbing after I took some of the round out of the pole - figured I might use a plain or a draw knife to give a little bit of a "flat" since I wouldn't reasonable be able to do the more ovoid cross-section that it appears is present on the full-length glamour shot I've seen of the original. One question that has come to mind - would the top have been wedged, the way we do modern axes and sledge hammers, or would one rely solely on a snug fit of the round pole in the round socket, with the mechanically affixed langets? Interesting point: the blade-side langet is detached, which appears to be the case with the original - it is slightly inset into the pole and burrows just underneath the socket, I suppose to aid in keeping it from rotating and staying more firmly in place after the shock of several blows.